On my last trip to Walt Disney World, I finally got to experience the next phase of New Fantasyland in the Magic Kingdom. I have previously visited the Storybook Circus section and so was excited to see what this next portion had in store for park guests. While I of course, didn't get to expreience EVERYTHING...I certainly did get a good taste of the new area as a whole and wanted to share with those of you who are still planning on taking your summer trips to Walt Disney World. Second...keep in mind, this new area is BUSY. Especially during the afternoon. People, of course, want to check out the new area first thing, so once they get to the park, they head here, OR it is the mid-point on either side now for touring, so by the time the afternoon hits, they are at the mid-point of their circle around the Magic Kingdom. Just something to be aware of. If you don't care when you check out the area, I would probably suggest checking it out later in the evening. Boy is this one a time sucker! I don't mean that in a bad way, I just mean...you will be waiting in a VERY long line to experience this one. The line moves slow too...because of the nature of the show, only a few people are let in at a time. I'd say anywhere from 35 to 50 or so people are let in at one time. Another slight problem, the queue, which is beautiful, is almost all outside. Not so much fun with the Florida heat. I think Brian got a touch of heat exhaustion while we waited here. Once you get inside, there are some really neat elements. 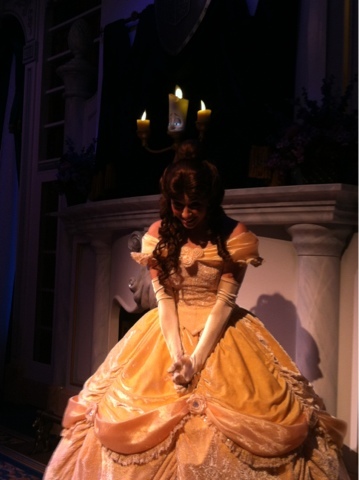 The first is the Enchanted Mirror, which really does just look like a mirror, until magic sets in. The other aspect that is amazing is the AudioAnamatronic figures they use (although, at this point, it's hard to tell if these new versions are AudioAnamatronics because they are more projection in nature...but REALLY cool none the less.) You really think they could be real! 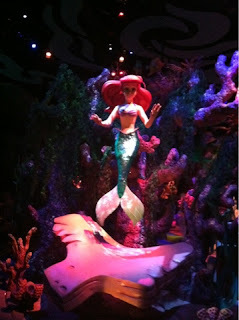 I got to see this attraction in DCA last year, but I do really like the ride. I think it is a great and fun new version of a dark ride with better sets and good effects. I really liked the effect of going under the water...but don't get stuck there...the air blows out super cold! My favorite scene has to be the Under The Sea portion. It is just so fun and lively! Lots of great colors and great AudioAnamatronics. Plus, there's that song! I also really enjoyed the queue here. This one is SO much better than it's DCA counterpart. 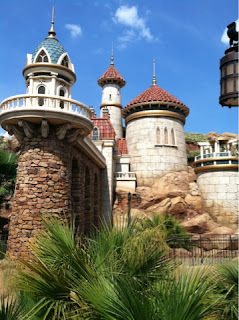 It really takes you to Prince Eric's castle (which is gorgeous!). There is so much detailing here. And I love the waterfall, which is so nice to see water in Fantasyland again! The crab game for the queue looks fun, but I didn't get to take part in it because the line was actually moving pretty well when we were there. Overall, this is a stellar attraction and it's great to have a new version of a dark ride in Fantasyland. 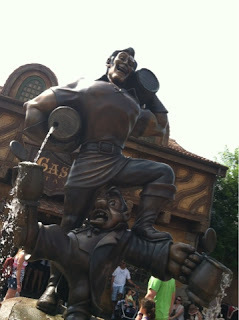 Ok, I didn't eat here, but I did peek my head in...and yep...the place looks like it was made for Gaston. Lots of woods and animal pieces. I didn't get to try it, because it was SO hot when I stopped by, but the pork shank does look delicious. Hard to want to eat it when it's a bazillion degrees outside. But I will try it at some point. Two things I did not partake in were Be Our Guest Restaurant, though I expect to remedy that in July (and cannot wait to do so...) and the meet and greet with Ariel. I'm just not a big meet and greet girl, so I see no need to meet her just yet. Overall, this new section of New Fantasyland is incredible. It is simply amazingly themed, that you almost forget you are in the Magic Kingdom. (Until you see the very large crowds!) While some of it's pieces may be a little lacking, the hope is that when it fully opens up in 2014, that it will all tie in together nicely. I was going to also discuss Storybook Circus, but I'll save my thoughts on that topic for next time. Rikki - I did Ariel in DCA a couple times and have always been disappointed with all the flash photography being taken (despite the rules and warnings) - more so than any other ride I've been on except Spaceship Earth. It ruined some of the effects. Is the flash photography as bad in WDW's version? Hmmm...I didn't notice a lot of flash photo on it at WDW. I went on it twice, so hopefully that wasn't a fluke...though I didn't notice it when I went on it in DCA either. 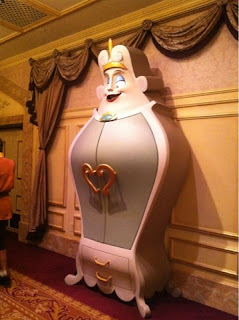 But at that point, I was just excited to see it, since it would still be 6 months before seeing it in WDW.